As parents, we spend half our lives using our extra-third-eyeball watching for dangers to our children….parking lots, hot stoves, potential falls and more… ‘Watch both ways before you cross!’ ‘Seatbelts save lives’ And the ever-popular…’Make good choices!’ But how much time do we spend looking at dangers posed to our kids online? Do we even know what’s going on behind that screen time? and learn how you can receive a FREE Router Limits device! There isn’t much else as up close and personal to our kids these days than apps like Instagram, Twitter, Snapchat and Facebook…. Are you paying attention to how much, when and where your kids are online? Like you, we’ve heard plenty of studies listing reasons to limit screen time. Many are related to learning ability, growth and physical fitness. Maybe you are like me in sharing a repeated struggle of asking your kids to ‘Turn that thing off.’ What’s more… I can’t tell you the number of times I’ve told my kids not to randomly search content and images online. No matter how innocent the search terms- something inappropriate almost invariably pops up. While growth, learning and regular exercise are all compelling reasons to watch your kids network activity, there are yet unseen dangers to your kids online= Predators lurking in the shadows of the internet. Internet World Stats.com estimates almost half of the world’s population is online. http://www.internetworldstats.com/stats.htm Any one of these 3.7 billion people may have fingertip access to searching, tracking and stalking your children from anywhere in the world. Why is internet safety so important? What could happen really? With a large population of people online in the world your child has potential for daily exposure to inappropriate content, identity theft as well as individual internet creeps and stalkers. Did you know… the internet is also a main hangout for organized crime? In 2011, the FBI reported there are approximately 1.4 million active street, prison, and OMG gang members comprising more than 33,000 gangs in the United States alone. Gang members prefer money makers like drugs, but also human trafficking because it is a re-usable commodity. Montana’s Internet Crimes Against Children Task Force Reports 1 in 25 youth in Montana will receive an online solicitation where the solicitor tried to initiate offline contact. It’s estimated 1.2 million children worldwide are victims of human trafficking. Traffickers prey on children because they are vulnerable and moldable. Victims are lured in, groomed, conditioned and brainwashed. It is a tested and true process passed on through generations of traffickers. http://www.endslaverynow.org/blog/articles/basic-stages-of-grooming-for-sexual-exploitation Traffickers move frequently from state to state and hide in the shadows of the internet and websites like Craigslist and Backpage. Call Comtech at 406-373-8395 and mention PROMO CODE: LIMITS18 to learn how you can receive a FREE Router Limits device! But this is Billings, Montana? Those things don’t happen here! A statement those working to bring awareness to internet dangers and trafficking hear all too often. A few years ago my eyes were first opened to trafficking in Billings. It happens here. A recent article in the Montana Quarterly tells of two incredible stories where young girls were lured into trafficking in Montana and were later rescued. They now work to help other girls and tell their stories openly to bring awareness to the dark truths of trafficking. Get Involved. Know what apps your kids are using, how often and for how long. You are not your childs best buddy. YOU are their staunch and fearless protector. Take Action! Beef up your network! Here’s where Router Limits can help. Installing parental control with filters and blocks on your home network allows for tracking and control of screen time and activity. 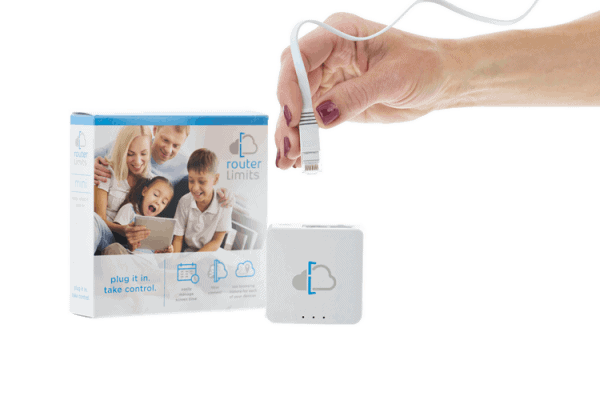 At a cost of just $80-100 for a Router Limits device and $15-20/month for cloud service, you can have a professionally installed, intelligent addition to your network with many features for tracking and locking down usage and protecting your children. It’s a very affordable option for safety and… so worth it. You can’t control every second of your childs life- But you will know what they see, do and hear at home! This might be the product that saves your kid’s lives. Special OFFER! Call Comtech at 406-373-8395 and mention PROMO CODE: LIMITS18 to learn how you can receive a FREE Router Limits device! Router Limits is more than a net nanny… you track what your kid is seeing online and blocks websites you don’t want them to see. And… you can choose when they are allowed to see it. It works even if they are incognito mode or have cleared their history. You can set up multiple users.Once it’s installed it’s easy to use and change. What’s more- it works for any device on your network including iPhone and Android cell phones, smart TVS, Xbox, Play Station and Bluray Players- anything connected to the internet. Whether you just want to limit, video game or tv time or you are more worried about other risks- Router Limits assists you in keeping that third eyeball out on your kids screen time. Check it out here: http://www.comtechmt.com/residential-systems/home-network/Call Comtech at 406-373-8395 and mention this article to learn how you can receive a FREE Router Limits device! Melanie Tripp is on the board as PR Director for Zonta Club of Billings. She is an entrepreneur and owner of Comtech Audio Theater Security, Drones of Montana and LocoTown Custom Gear.